Maintenance is one of the pillars of having a happy, healthy pool. Humble Lawn & Pool is more than happy to service it for you, but we also understand that owner’s knowledge is vital in our partnership to provide you with the best service possible. To help you know how to best maintain your pool, here are a few of the most common questions we’ve received throughout our 40-year history of serving Wichita and the surrounding area. Is It okay to turn off my pool pump? The filtration system serves a vital purpose in keeping the water in your pool circulating and crystal-clear. To this end, you will want to keep the pump motor running as often as possible. This doesn’t necessarily mean that you have to leave it on 24 hours a day, but the more work your filter does to keep contaminants out of the water, the less chemicals are needed. Each pool setup is different regarding the amount of time it takes to do a complete turnover cycle on your water, though a typical system should cycle the water around every 8-10 hours. So, while it’s best to run your pump constantly, we can install timer boxes to run the pump less if you wish. You could also consider investing in a variable pump, which is much more energy efficient and can give you considerable savings in the long run. Should I drain my pool, and if so, when? Simply put, you should never drain your pool. This task is best left to the professionals here at Humble. Though emptying your pool may be necessary on occasion, you should never try to do it yourself. 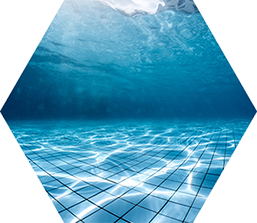 The process creates the risk of seriously damaging the pool, especially after heavy rains since the rising water table could be putting a lot of extra pressure on the body of your pool. With that being said, sometimes the best and most cost-effective solution to getting your pool back into swimmable condition is to replace the water. We analyze each situation individually to determine if this service is needed, and how best to minimize the risks involved. These observations do not apply to spas. Due to the higher temperatures and smaller volume, we recommend draining and filling a spa twice a year on average. Spas with heavy use often require this more in order to maintain healthy water. What is backwashing? How often do I need to do it? Backwashing refers to, simply put, cleaning your pool’s filter. Over time, sediments and other contaminants will collect in the filter, and need to be rinsed out. The best way to tell if your filter needs to be backwashed is by monitoring the pressure gauge that should be attached to the filter or multiport. After backwashing out well and emptying all of the baskets, note your starting pressure. Once this pressure reaches 10-15psi over your starting pressure it is time to backwash again. We offer a standalone chemical check and backwash service that will handle all of this for you. How should I deal with freezing temperatures? Because we live in Wichita, KS and not Orlando, it’s inevitable that our temperatures dip down into the freezing level typically starting in November. These cold conditions can cause major damage to the pool and equipment if not properly winterized. This does not require all of the water to be drained from the pool as some people believe. In fact, in most cases, it could cause significant damage to do so. Instead, our technicians use a combination of high-pressure air blowers and antifreeze to make sure your pool will make it through even the harshest winter conditions and be ready to swim again come spring. How often should I test my pool water? You should check your pool water weekly to ensure that all levels are balanced, and that there is sufficient amount of sanitizer (typically free chlorine) in the water. The basic tests that a homeowner should be capable of doing are for free chlorine, PH, and total alkalinity. PH level should be maintained between 7.4 -7.6. Total alkalinity levels should be maintained between 120-150ppm. Free chlorine levels should stay around a 3ppm. There are numerous other tests that our technicians utilize (phosphate, nitrate, salt, calcium hardness, TDS, etc.) in order to fine tune your water and keep your pool looking great all summer. As always, Humble Lawn & Pool is more than happy to help you maintain the chemical balance of your pool, or handle any other areas of maintenance or service. What is the difference between a salt pool and a chlorine pool? We get this question all the time from customers who are considering switching over to a saltwater pool. The simple answer is that the only difference is how chlorine is introduced into the pool. Many people don’t realize a saltwater pool is still sanitized by chlorine. Instead of adding chlorine directly to the water however, it is generated by the installed salt cell breaking apart the sodium and chlorine molecules. This method of sanitation is often preferred because it does not add any other unwanted chemicals to your pool, such as cyanuric acid which, at high levels, limits the effectiveness of the free chlorine. There may also be a cost savings to having a salt cell, though the initial equipment setup requires an upfront investment. Please contact us if you have any questions or would like to discuss switching your pool over to saltwater. Why is my pool green or cloudy? Nobody likes to look out their back door and see a green or cloudy pool. Unfortunately, all pool owners deal with these issues from time to time. While there may be many different specific causes, pool clarity boils down to proper sanitation and filtration. There is no “silver bullet” answer to clear up a pool in any situation. The best course of action is to call our office as soon as you begin to see a change in your water clarity. Often, if caught early, the issue can be resolved quickly. The longer it goes before treatment begins, the more time and cost is incurred to clear the water up. It seems like I have to add water every day. Could this be due to evaporation? Water loss due to evaporation will never cause the water level to drop enough on a day-to-day basis to require adding water daily. As a rule of thumb, if your water loss is more than 1/8” per day, there is an issue with a leak either in the equipment or in the pool structure. This may be a simple as replacing a worn o-ring, or may require more in-depth troubleshooting. Either way, our technicians are experienced and equipped to help pinpoint and fix the source of the problem. Do you require service or maintenance contracts? Our company has never required any contracts in our 40+ years in order to retain our services. We believe in letting our level of service speak for itself, so all service and maintenance is done on an at-will basis. Do I need to be home to pay at time of service? No, all of our billing (outside of major repairs) is done on a monthly basis. We offer free ACH bank drafts or you can mail a check to our address listed on the invoice. These questions and answers will help give you a basic understanding of some of the major steps in maintaining your pool, but if you need assistance in any other way, we’re happy to help!